The Greeks used pieces of amber in jewelry. They noticed that when amber was rubbed with cloth, it attracted light objects such as hair. The amber could pick these things up off the ground, despite the gravitational forces pulling them down. It seemed natural to attribute this behavior to the amber. Subsequently, anything that displayed similar behavior was likened to amber. The property of amber electrostatic charging comes from triboelectric effect. To understand the electrostatic charge, you need to think about the atoms that make up everything we can see. All matter is made up of atoms, which are themselves made up of charged particles. Atoms have a nucleus consisting of neutrons and protons. They also have a surrounding "shell" that is made up electrons. Typically, matter is neutrally charged, meaning that the number of electrons and protons are the same. If an atom has more electrons than protons, it is negatively charged. If it has more protons than electrons, it is positively charged. Static charge is most often generated by contact and separation, or "triboelectrification." When any two materials touch and then break contact, there is an exchange of electrons; one material will be left with an excess, and the other a loss, of electrons. Some atoms hold on to their electrons more tightly than others do. How strongly matter holds on to its electrons determines its place in the triboelectric series. If a material is more apt to give up electrons when in contact with another material, it is more positive in the triboelectric series. If a material is more apt to "capture" electrons when in contact with another material, it is more negative in the triboelectric series. The triboelectric series is a list that ranks various materials according to their tendency to gain or lose electrons. It usually lists materials in order of decreasing tendency to charge positively (lose electrons), and increasing tendency to charge negatively (gain electrons). Somewhere in the middle of the list are materials that do not show strong tendency to behave either way. Note that the tendency of a material to become positive or negative after triboelectric charging has nothing to do with the level of conductivity (or ability to discharge) of the material. The relative position of two substances in the triboelectric series tells you how they will act when brought into contact. Glass rubbed by silk causes a charge separation because they are several positions apart in the table. The same applies for amber and wool. The farther the separation in the table, the greater the effect. A common complaint people have on static electricity is that they shoot sparks when touching objects. This is typically caused because they have dry skin, which can become highly positive (+) in charge, especially when the clothes they wear are made of polyester material, which can become negative (-) in charge. Neutral materials or those close to neutral are probably the best for peoples' living environment. The goal is to avoid creation or exposure to a large electrostatic charge. Despite the fact that it was amber that gave it's Greek name to electricity, amber is quite close to the middle of the table, relatively to the synthetic negative materials, not much away from the neutral ones. 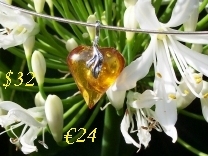 Amber jewelry, as compared to other materials used in living environment can be considered slightly negative or close to neutral. 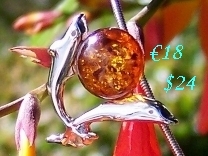 Also, the active surface of amber jewelry is small or very small and can't be meant as significant.